Rafts of oyster firms are spread all over. The marina’s web pages show approach routes, the rafts positions and buoys at the rafts corners well. 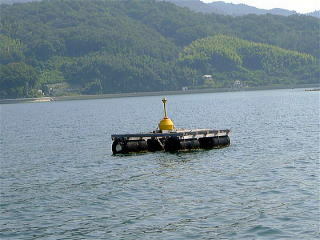 As you proceeding to the marina, you will see big yellow buoys on floating boards, which indicate the corner of the rafts. Two courses are shown on the second web page above. One goes through between the rafts; another goes around the rafts. I recommend you the near-land going around course, because it is less risky for visitors. On my Google map, the red line (= my original route plan) hits the oyster rafts before the marina. Then, as the blue line (= track chart) shows, you move widely to northeast and go around the rafts. There are rafts in front of Okino-shima Marina. 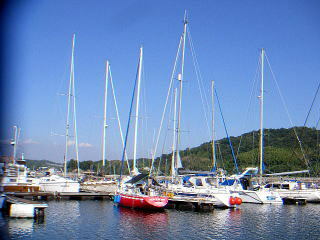 After going around the rafts, you will see many sailing boats mooring at the marina. If you call the marina office, the marina staff will go out and take your dock lines. Okino-shima Marina is a typhoon heaven in Seto Inland Sea. It is a scenic marina, 15 miles (27 km) away from Hiroshima. People in Hiroshima, Tokuyama and others recommended me to visit here. While its land access is not convenient, it is a calm beautiful marina surrounded by green islands and peninsulas. It was bigger than what I had expected. I also saw distinctive-looking sail boats here. While there are houses on the opposite shore, no house or no shop around the marina. The island of the opposite shore is Eda-jima Island which had a famous naval academy. The south half of Eda-jima Island is called Nomi-jima Island, which is now bridged with Okinoshima Island. The cove of the marina at Okino-shima was a typhoon heaven for fishing boats. It is no wave cove sheltered with green hills. Toilet is douche-equipped. Its mirrors are well polished. Power and water are available at the pontoon. Long water hoses were housed in boxes to be protected from the sunshine heat. It was new for me. Even at big marinas, water hoses are exposed out to the weather and its surfaces are melted. Melted hoses make your hands and clothes dirty, which can’t be removed without lacquer thinner. The housed non-exposed hoses won’t be melted. I felt generous hearted spirit of the marina. I strongly recommend your visit with plenty of foods loading, because no shop or no restaurant around the marina. The marina has shower rooms and a gas stand. A coin laundry requires a bus ride. 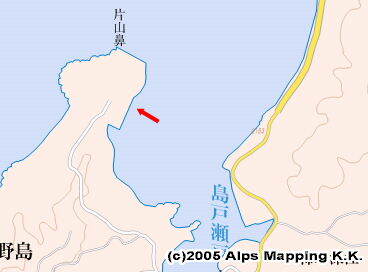 Okino-shima Marina has Japanese web site, in which two pages above show the rafts positions and approach routes. The marina will be suitable for your long stay. Or, you might leave your boat here and go away for long time.